This is a healthy one! We had it with steamed brown rice. It was really good. Just make sure you use all the sauce as it helps the veggies steam in the pocket. I made this on Monday during my cooking hour and we ate it last night. I used frozen shrimp and they thawed in the pockets and cooked just right. You could even add frozen snap peas or pea pods if you want more veggies. Tear 5 pieces of foil into 18 inch strips. Brush each with canola oil. Mix sauce and pour 1 T over each. Fold foil in half and seal edge by folding in 2-3 times. Fold both ends in 2-3 times to make a sealed pocket. 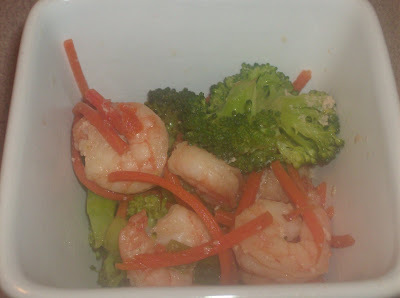 Cook in 400 degree oven for 12-15 minutes or until shrimp is cooked through. Serve over steamed rice. « 5 minute steak dinner on a WEDNESDAY!